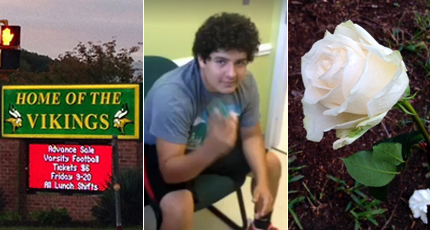 WASHINGTON – Police now say 12 people have been arrested in connection with the incidents surrounding the abduction and fatal stabbing of a high school senior in Woodbridge, Va.
Diandra Samuels, 19, of Woodbridge, has been charged with murder in the death Saturday of 18-year-old Kenny Diaz, also of Woodbridge. Police say a friend of Diaz had been robbed by Samuels, that Diaz and others went to Samuels’ home to rob her in retaliation and that someone with Diaz brought a gun. At the home, police say one of Samuels’ friends got control of the gun, and that Samuels’ group abducted Diaz while he tried to escape. They allegedly forced him into a car and drove to a park, where police say Samuels stabbed Diaz. Diaz was found bleeding from his stomach in Marumsco Acre Lake Park in Woodbridge, Va., around 3:15 p.m. Saturday, police say. Samuels has been charged with murder and other offenses. Seven others have been charged with abduction. “The other suspects were basically charged with abduction because they aided in getting Diaz into the vehicle and then over to the park where he was killed,” says Officer Jonathan Perok, a Prince William County police spokesman. Police say several 16-year-old boys from Woodbridge who went with Diaz to confront Samuels also have been arrested and face attempted armed robbery and other charges. Perok says the number of suspects police had to track down and interview complicated the case. Six suspects were arrested Monday. Six more people were arrested Tuesday. All of the adults were being held without bond and are scheduled to appear in court Dec. 2. The 16-year-olds were being held at a juvenile detention center, but information about a court date was not available. Diandra Janae Samuels, 19, of Woodbridge, Va.
Dominic Glenn Smith, 26, of Woodbridge, Va.
Deneen Antoinette Williams, 29, of Woodbridge, Va.
Renee Claytor Caples, 22, of Woodbridge, Va.
Teena Marie Gerbozy, 24, of Woodbridge, Va.
Gregory Allan Bonds, 22, of Woodbridge, Va.
Airel Juanita Adams, 19, of Woodbridge, Va.
Four 16-year-old boys (juveniles), of Woodbridge, Va.
Charges: Attempted armed robbery, use of a firearm in commission of a felony, conspiracy to commit a felony. Note: One of the 16-year-old boys arrested was not present at the actual encounter at Samuels’ residence. However, he is still connected to the incident and charged with the same offenses.